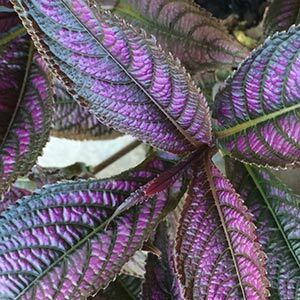 If you have a shaded warm position in the garden them Strobilanthes dyerianus with its brilliant foliage is a must have plant. This is an understory shrub from tropical regions that has found its way into many landscaping schemes. Sold as an evergreen perennial, this is in warmer climates however it will struggle outdoors in cold winters. It is a foliage plant, and one that delivers. Use it to underplant taller shrubs in warm positions. Or maybe grow in a container just for the sheer brilliance of the foliage. Strobilanthes dyerianus is a plant that need protection from frosts, it will thrive outdoors in sub tropical climates, and can be grown indoors as well. In cooler climates it can be grown in a protected position out doors, however its foliage is good enough to warrant planting it as an annual. The foliage is a very deep purple, with iridescent silvery purple markings. Almost metallic in look. Very easy in warmer climates. In cooler areas, grow in a warm protected position, or use this as a patio or indoor plant. It is best to prune Strobilanthes dyerianus regularly, tip pruning or pinching back works well. Regular applications of fertiliser using a slow release type as well as monthly application of a liquid fertiliser will ensure good foliage growth. Height – 1m easily pruned. Foliage – Glossy purple with silvery purple metallic markings. Flower – Blue, however foliage is the main attraction. Landscaping Uses – Ground cover plant for mixed color with other plants. Excellent textured foliage. Easy from softwood cuttings taken in spring. Plants will root in water and can then be potted up.